At Marula Landscape & Design, we understand that the outdoor aesthetic of your home or business is as important as your interior. We have a team of experts that will consult with you to determine your exact needs. 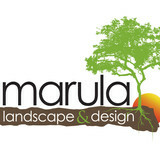 From landscape to new construction, our residential and commercial clients know that when they call Marula Landscape & Design they will get the best. Dieter Mohr has over 10 years of experience and we professionally design and install quality landscape and outdoor construction for your home. 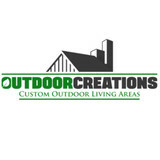 Our company has grown over the years from a two person operation to a group of professionals able to meet all your outdoor needs. We are dedicated to building long term relationships with our clients by providing the highest standard of quality on each and every project we do. Our reputation for customer satisfaction in the San Antonio & Boerne area is what has made Marula Landscape & Design a household name in the industry. We are a proud Stonemakers dealer that allow us to create resort style waterfalls and realistic hand carved retaining walls made from special concrete that is twice as strong regular methods. Besides natural stone masonry we are also an ICPI paver installer. Our team installed the Belgard paver display at the TLNA show in 2014. We now also offer PGA quality putting greens & artificial turf solutions. This includes replacing your regular grass with amazingly realistic artificial turf that requires virtually no maintenance. We can also design and install outdoor kitchens, pergolas, patios and fire pits, which are a great way to enjoy and add value to your home. Let us design your custom outdoor living area. *Belgard Authorized Contractor* We will create the backyard oasis of your dreams! Esposito Hardscapes is a family owned and operated landscape construction company. Established in 2015 in San Antonio, we specialize in creating beautiful landscapes for our clients. We offer construction services such as paver patios, flagstone patios, custom outdoor kitchens, walkways, pool decks, retaining walls & more! With over 20 years experience, Esposito Hardscapes is the leader in providing quality landscape construction services to our loyal customers. We focus on creating a successful partnership with you throughout the construction process. Our pledge is to establish lasting relationships with our customers by exceeding their expectations and gaining their trust through exceptional performance by every member of our team. J G Williams is a minority owned business that has been serving San Antonio and surrounding areas for over 20 years!! We always strive for excellency because we put our name behind every project we do which is why we dont charge for work up front and we always follow up with our clients to ensure their 100% satisfaction with our work. 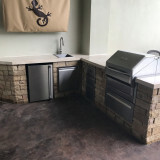 Outdoor Creations in San Antonio is committed to providing our customers with the highest quality of landscape Construction And Outdoor kitchens and all other Landscape services available. We take pride in our workmanship and customer relations which provides us with the ability to grow as a company, as individuals and as a leader in the Green Industry. We create outdoor spaces naturally extending the inside of your home. We do this by taking pre-existing elements used inside your home and implementing them in your yard. Elements include tile, wood flooring, granite countertops, wall paint coloring, and natural stone. In addition to using the elements you already have in your home, many of our clients want relaxing spaces they can enjoy after a hard days work. We know you work hard, and we are passionate about designing and installing that perfect, peaceful, and relaxing outdoor environment. While in college back in 2003, my family had started a granite business in Texas. As a graduate of IT and computer programming, I was asked to come to our family business and see what the business was like. Upon my initial visit, I was showing the technology involved in cutting and fabrication of granite slabs. The most impressive knowledge of granite business was a CNC Operating Machine. CNCs are top of the line fabrication machinery, as these start in the quarter million and only goes up. Not many granite companies can acquire such expensive equipment with the high end tech. This machine coded automation machinery was able to cut, shape, polish slabs of countertops at 10x the speed of human fabricators. This and a combination of laser templating allows us to work on any projects, banks, hotels, remodel and new construction homes with precision and accuracy. As a college student that was getting ready to graduate, this was a field that I did not know of existing, that I wanted to be a part of -Joseph Kim Since 1999, A2Z Granite & Tile has proven to be an extremely effective and professional Bexar County granite company. A2Z Granite & Tile can handle all of your residential and commercial granite, quartz or quartzite needs. While our primary focus is on residential customers, we also take on small-scale commercial projects, such as installing granite counters for hotel renovations, banks, apartments, and condominium and restaurants. If you are looking for quality granite countertops installations, contact A2Z Granite & Tile today for to request a quote. Our goal is to provide more than quality commercial building services. At Aquaproof, we provide responsive services that lead to efficient designs and effectively completed projects. From the initial consultation to the completed project, we go above and beyond. Our designers, project managers, and build teams communicate on a daily basis, ensuring projects stay their course. It is easy for you to notice our services are a little different. It's because of our commitment and level of engagement. Nothing is more important than doing our best. So, when you want your project done right, make sure to talk with us. 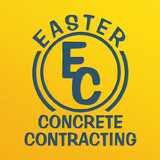 Our company is the most reliable concrete and masonry service in the area. Our customer service history is impeccable. With over 30 years of experience in the commercial and residential business, We can design and create your ideal project for your home or office. Stamped Concrete is quick easily installed and durable and virtually free from complicated maintenance. Decorative Concrete takes half the time of natural materials. Paramount Construction Co. Inc. was established and registered with the state of Texas as a corporation in 1987 by PJ aqnd Norma Lozano. In 2004 the name changed to S/A Paramount Co. Inc.
Rock Haus Stone Co. is a natural stone and landscape supply wholesale and retail distribution yard servicing San Antonio and the surrounding areas.. We carry a large selection of flagstone, boulders and river rock, along with grass, soils, mulches, sand, gravel and cement. Our flagstone and building stone selection offers a wide variety of colors and sizes of stone from Oklahoma, Texas and Mexico. We keep all of these products on hand and we are constantly searching for new products to better fit the needs of all our customers and contractors. From installing new exterior columns to repairing your chimney, masonry contractors can help you add both visual appeal and value to your property. They’ll know what kind of installation makes the most sense for your San Antonio, TX climate and regional style. Looking for something that will develop a patina with time? Or would you rather have your home feel brand new for years to come? Choosing the right kind of stone involves thinking about the future, too. Experienced brick suppliers and stone suppliers can help you find the material that will work for your home now and for years to come. These professionals aren’t limited to exterior work either. Whether you want a split-stone granite wall in the kitchen or need help installing traditional brick masonry on your fireplace facade, you’ll want a professional to get it right. If you’re already working with an architect or designer, he or she may be able to suggest a good San Antonio, TX subcontractor to help out. Here are some related professionals and vendors to complement the work of stone, pavers & concrete: Landscape Architects & Landscape Designers, Architects & Building Designers, Garden & Landscape Supplies, Driveways & Paving, Siding & Exteriors. Find stone, paver and concrete professionals on Houzz. Search the Houzz Professionals section for San Antonio, TX stone, paver and concrete professionals. Browse photos and read reviews, and contact a pro if you like their work.